CENTRAL GOVERNMENT EMPLOYEES NEWS: According to the Sources the important Points of the 7th Pay Commission’s Recommendations are .. 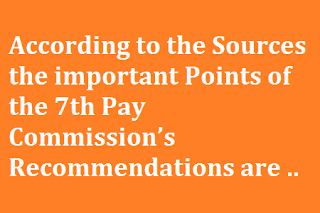 According to the Sources the important Points of the 7th Pay Commission’s Recommendations are .. The 7th pay commission has been given 18 months’ time from date of its constitution to make its recommendation. Hence the tentative date for submission of Report will be 30th August 2015. The sources close to the 7th Pay Commission, on the condition of anonymity told that the 7th pay Commission Report is almost finalized and the Report is expected to be submitted on or before 14th August 2015. The Leaders representing one of the railway federations in the staff side also confirmed this news. 6. Percentage of HRA will remain same. 7. The Criteria for retirement age will be either completion of 33 Years of service or at the age of 60 Years whichever is earlier. 10. The 7th Pay Commission recommendation will be implemented with effects from 1.1.2016. Further ,the sources told that the Committee of Secretaries will be appointed to study the report and analyze the financial implications upon implementation of 7th pay commission recommendation. An ally of NCJCM Staff Side told that the Staff Side also will be invited by the third week of September 2015 by this Committee before giving its final nod for approval for this Recommendation. It appears that after three decades the Pay Commission recommendations will come into force on the first day of its due date. Retrospective effect will not be required for implementation of 7th Pay Commission recommendation, since the notification for implementation of 7th Pay Commission recommendations might be issued on or before 1.1.2016. So there will be no financial burden for government on spending for payment of Arrears to this effect. It is indeed very good news for entire central and some State government employees community. 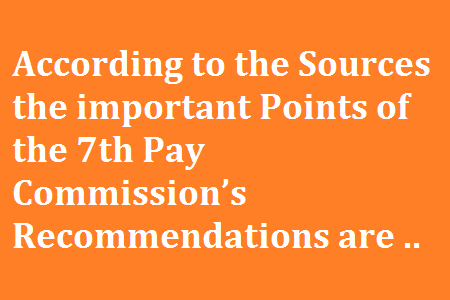 There are expectations on its peak over 7th pay commission recommendation. Whether the 7th Pay Commission’s recommendation fulfill their expectations or not?. Let’s hope, by the time of next month, everything that is concealed will be brought to light and made known to all.